Welcome to Tampa and CEC 2018! As you read this article, Robin and I are in Tampa checking out all the last minute details for our Executive Committee meeting, the member meeting, the CASE booth, the Spotlight session with Julie Weatherly, and of course CASE night! If you are coming to CEC, we will be looking forward to visiting with you at all the CASE activities. If you are not in Tampa but need something from the CASE office, please email me. 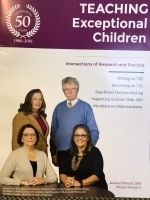 Speaking of CEC... Did you get your January/February edition of Teaching Exceptional Children? I always look forward to this great magazine but this issue was a special treat with the picture of the CEC leadership on the cover! We are so proud of these ladies and gentleman and their leadership! I hope you are reading your TEC issues — they have great information some of your teachers need to have! In fact, maybe you should consider the District membership which gives you a Premier membership, CASE membership and basic CEC membership for 5 of your teachers! And you get access to webinars and other great benefits! 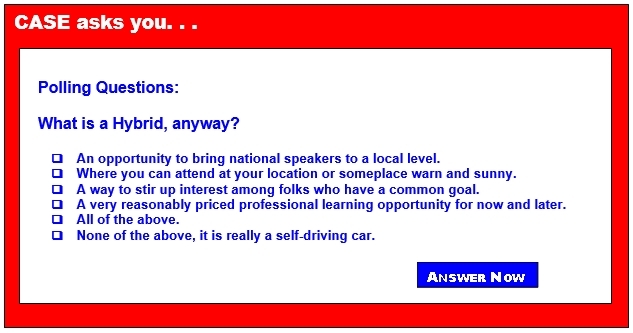 Check out this "professional development" package that masquerades as a membership! Speaking of our annual member meeting ... Remember EVERY CASE member is invited and welcome! Exceptional Child will be sponsoring our full breakfast at 7:30-8:30 on Wednesday, Feb. 7 just before our annual member/BOD meeting at the Marriott Waterside Salon V. This will not be a continental breakfast but a full breakfast — we hope if you are coming to CEC you will be sure to arrive in time to attend our member meeting on Wednesday and join us for breakfast! CASE has a proposed set of By-Laws that will be voted on at the CASE annual meeting, Feb. 7 at the Marriott, Tampa, Florida. I hope you have looked at them! Our website has the proposed By-laws and the tracked changes on the home page. For the most part there is little fiscal impact on these changes and mostly revisions to how we are actually conducting the various duties of the particular officers, committees, etc., cleaning up some of the language, and making it easier to meet our strategic goals. Just as our world has changed, so has CASE. I hope you will look at these documents and let us hear from you. At the same meeting, we will have a great break in the afternoon and that will be provided by eLuma and shortly after the break our Awards for individuals and units will be given. The Awards will be sponsored by Master Teacher. On Thursday, Feb. 8, Houghton Mifflin Harcourt will be sponsoring Julie Weatherly's Spotlight Session: 90 Tips in 120 minutes in Ballroom C in the Convention Center. Also on Thursday evening, Feb. 8, we will be having CASE Night — a dinner cruise sponsored by Star Autism and Winsor Learning/Sonday Systems. There are several other non-sponsored events so to make sure you don’t miss anything, be sure to check out the CASE Activities at CEC! The vote will be at the member meeting. Hope you will be at CEC and will arrive on Tuesday so you can join us for a full breakfast and the all-day meeting. Be sure to check out all of the CASE activities at CEC. Hope to see you there! There are still a few CASE NIGHT tickets available but you are running out of time! We are so excited about this year's CASE Night — a dinner cruise on Tampa Bay! The boat will leave just steps away from the convention center so no added transportation. Tickets will be $65 but remember it is sponsored so for that amount, you are really getting an event that is worth much more! We will have dinner, drinks, music, dancing and of course more fun than you can shake a stick at all on a beautiful sunset cruise! Special thanks to our very special sponsors for CASE Night — Star Autism and Sonday System! The tickets are limited so get your tickets today! And about that To Do List ... Have you registered for our CASE Hybrid yet? We really don't want you to miss out on this great opportunity for personal, staff and district professional development at a price you cannot beat! We usually have the CASE Hybrid in February but since CEC is in February this year, we are doing it the first full week in March. If you haven't looked at the Hybrid as a great professional learning opportunity for your school/district, then you need to re-think about it! We even will give you Hints on how to get it all together! This year we will once again have two extraordinary speakers and two different subjects — so you may want to invite different folks on the different days. Remember you pay one low price and can have as many as you can accommodate in your session! Last year we had 99 virtual sites in 36 different states! But of course, you can join us onsite at the lovely Westin Hilton Head Island, Hilton Head Island, South Carolina. Register today — and don't forget to add in the DVD for future use! Your answers will be shared at CEC! ... I hope you know how very important your voice is to CASE and CEC! I really appreciate your participation again this week as we changed our format to you're your ideas and concerns on teacher retention. This topic will be discussed by the CASE representatives to the CEC Representative Assembly to be held on Friday, Feb. 9 in Tampa. Since we used a different format, we don't have percentages but click here to view answers from the three questions. They were all very thoughtful answers and your voice will be heard! President Donald Trump's State of the Union: Short on education!